A new species of the cyclopoid genus Australoeucyclops Karanovic, 2006 is described from several disjunct locations in south-western Western Australia. This is the sixth representative of this genus, which is endemic to Australia, New Zealand and Indonesia. Australoeucyclops darwini sp. nov. differs from all its congeners by its subequal apical spines on the fourth leg endopod and can also be distinguished from each species by a number of other characters. 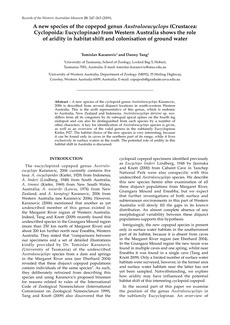 A key for identification of Australoeucyclops species is given, as well as an overview of the valid genera in the subfamily Eucyclopinae Kiefer, l927. The habitat choice of the new species is very interesting, because it can be found only in caves in the northern part of its range, while it lives exclusively in surface waters in the south. The potential role of aridity in this habitat shift in Australia is discussed.